Doug and Nancy Dear's Birdtail Ranch Quarter Horses breeding program flourished in Montana. Quarter Horse Journal photo. Doug and Nancy Dear of the Birdtail Ranch Quarter Horses in Simms, Montana, have earned themselves a place in the American Quarter Horse Hall of Fame. Their horses made a significant impact to the bloodlines that exist today, in the Northwest. The Western Horse Review would like to congratulate the ranch in being awarded the highest honour to any quarter horse breeder. The American Quarter Horse Daily posted in their ‘Hall of Fame Part 1’, the Dear’s biography, which celebrated their commitment to breeding top quarter horse bloodlines. Their list of stallions included Classy Bar (Sugar Bars-Mokey by Leo), open AQHA Champion Two Eyed Fox (Two Eyed Jack-Foxy Buck by Pretty Buck), and open AQHA Champion Jay Page (Page Lee-Zella Hep by Tucson A). Married in 1947, Doug and Nancy were Montana natives, raised riding and ranching. It was Nancy’s father, Curtis Diehl, who first took an interest in the “Steel Dust” horses that had arrived in eastern Montana in the early 1940s. Curtis bought a dun coming-2-year-old named Charlie Russell (by Texas Blue Bonnet) – the first registered American Quarter Horse to come into their part of the country. Curtis bred him to U.S. Army Cavalry Remount mares, along with a couple of palominos. His vision was to breed a horse that “would make better cow horses for us on the ranch,” Nancy says, a sound horse with a good mind and athletic ability in surefootedness and speed. After Curtis died in 1948, Doug and Nancy carried on, determined to buy the best Quarter Horses they could. Nancy says she and Doug “pretty much agreed” on horses and cattle. In 1950, they purchased Shirley Hunt by Tommy Clegg and out of Lady Coolidge by Beetch’s Yellow Jacket – a full sister to American Quarter Horse Hall of Famer Bert, bred by Bert Benear of Bartlesville, Oklahoma. Liking the Bert/Starway blood, in 1953, with Doug busy calving, Nancy returned to Oklahoma for the Nicholson sale. She came home with the stallion Bear Cat (Little Brother-Flying Mary, unknown sire); the mare N R Chipper (Tamo- Jane Hunt by Button) along with her weanling and yearling colts by Bert; and Little Dixie Beach (Tommy Clegg-Dixie Beach by Beetch’s Yellow Jacket), the dam of AQHA Champion Paul A. Those horses became the foundation for the Dears’ 60-year breeding program. Eventually, with mare herds as large as 35, they were raising more horses than they could use. In the early 1950s, they began an annual sale on the ranch to sell foals; they would end up holding “close to 50” sales. “At one time, we figured we had horses in about every state west of the Mississippi and five of the provinces in Canada,” Nancy says. They kept a constant eye out for horses to buy – helped by Doug’s travels as an AQHA judge – and they kept good homebred fillies. Their mares through the years included Miss Gillette, Burt’s Lady, Boulder Bell and Silky Lena Bars. Bred by AQHA Past President Bob Norris, Two Eyed Fox had also caught the eye of Hall of Famer Howard Pitzer when the Dears acquired the horse in 1972. The stallion crossed well on the family’s Bear Cat and Classy Bar mares, helping to put the Dears 12th on the leading breeders of AQHA Champions list. From fewer than 400 total foals, he sired the earners of more than 5,000 points and two Supreme Champions, 15 AQHA Champions and four Superior halter horses. Birdtail horses excelled at ranch work and in the show ring: “We used to halter our horses as well as show them in two or three events, and I think that should still be true today,” Nancy says. With a reputation for versatility and good temperament, they were in high demand for amateurs, youth and 4-H colt-to-maturity projects. “(The horses) had to have a good disposition, because our market always went that way (toward amateurs and youth),” Nancy says. The Dears’ daughters, Barbara and Dee Dee, made names for themselves in rodeo, 4-H and the American Junior Quarter Horse Association (now AQHYA), riding home-raised horses. 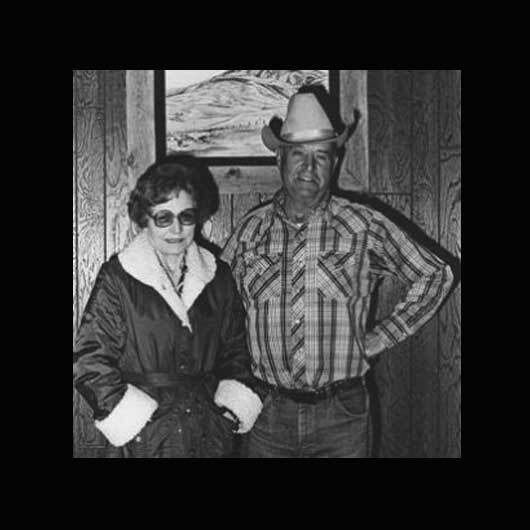 Barbara married Russ Pepper, and Dee Dee married the late AQHA judge Lennard Rains and remained involved with the ranch. Doug died in 1999. A scholarship in his name assists Montana students with their college education. Now 91, Nancy is still involved with raising horses and rides occasionally when health and help permit. The 2012 AQHA Convention in Las Vegas, will showcase the this year’s inductees including Gordon Hannagan, Walter Fletcher, Bob Loomis, Indigo Illusion, Streakin La Jolla and Hollywood Dun It. Loved this article – a great tribute! Doug and Nancy raised quality Quarter Horses. Their hard work and dedication did much to promote the breed and support the industry. I bought some of my first Quarter Horses from Birdtail ranch including the best mare I ever owned – Ma Dear (Pasamonte Paul x Pretty Bar Dear by Classy Bar). Many of the horses I have today carry Classy Bar blood through this mare, better known as Duchess. My husband and I also had a Classy Bar Stallion out of a Leo bred mare and a Classy Bar filly who unfortunately was killed by lightning. I drove to the ranch when I was in Montana in 2000 but no one was home. I later contacted Nancy by phone and told her what Duchess had done for me. She remembered the mare but that was no surprise – I doubt she ever forgot a Birdtail Ranch horse! Hey Sharon, Thanks for the article. The first registered Quarter Horse my family ever purchased was a mare named Classy Tangerina. Sired by Classy Bar out Dear’s Paula. She was purchased from Birdtail Ranch. She became my first AQHA youth show mare, we earned our youth ROM, and went on to be an exceptional producer. Her offspring earned well over 400 AQHA points. Her dauaghter, Classy CP Miss, was an AQHA multiple top 10 Reining horse. Her daughter Tangerina Too became a multiple halter futurity champion with performance points in 5 events. Tangerina Too is the dam of QT Too! QT Too is sired by my dad’s stallion Shiners Q Chex and she is an AQHA point earner and NRHA money earning mare, and the current Canadian Quarter Horse Association Champion Amateur Reining Horse. She has won both the Reining Alberta Sire Incentive Derby and the Canadian Supreme Sire Incentive Derby. We are truly grateful to Birdtail Ranch for such an amazing introduction to the Quarter Horse over 30 years ago, and I am blessed to ride a mare carrying their history.